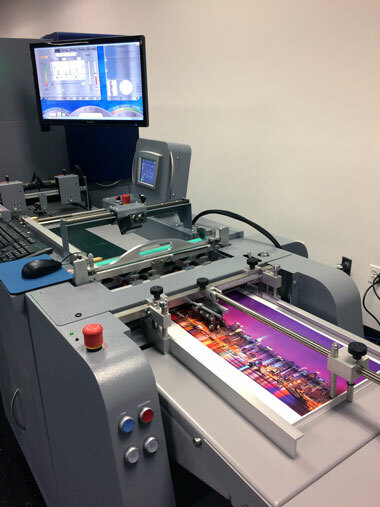 Digital Dog Direct has proudly added the MGI JETvarnish 3DS Digital Spot UV Coating and Hot Foil Stamping machine to its arsenal of high-performance digital printing equipment. Make your piece irresistible and move your audiences to action by leveraging the influence of touch, texture, and shine. The JETvarnish 3DS’s speed and simplicity allows you to create greater impact at a lower cost. Revolutionary high-speed output moves your material into the customers’ hands faster, applying spot varnish at 3,000 sheets per hour and embossed foil at 2,300 sheets per hour. Plus, LED drying and curing makes sheets ready for handling immediately. Because there is no minimum or breakeven point, you can easily print prototypes, short-run projects, and exact quantities with variable data foiling. In fact, the JETvarnish 3DS is 100% variable-data-printing-compatible for both text and images, from sheet to sheet. All of these innovations are available to you without the risk of compromising flexibility: run both flat spot coating and 3D raised effects on the same sheet, coat large areas or ultra-fine details, and print on paper from 8-1/2” x 11” to 14.33” x 40.15”. Most importantly, the JETvarnish 3DS produces pieces of the highest quality, overseen by the experts at Digital Dog Direct. Gain the competitive advantage and get noticed with endless combinations of varnish and foil without sacrificing variable data and on-demand functionality or G7 certified color output. Contact us today to learn more, request a brochure, or get a quote on your next project.